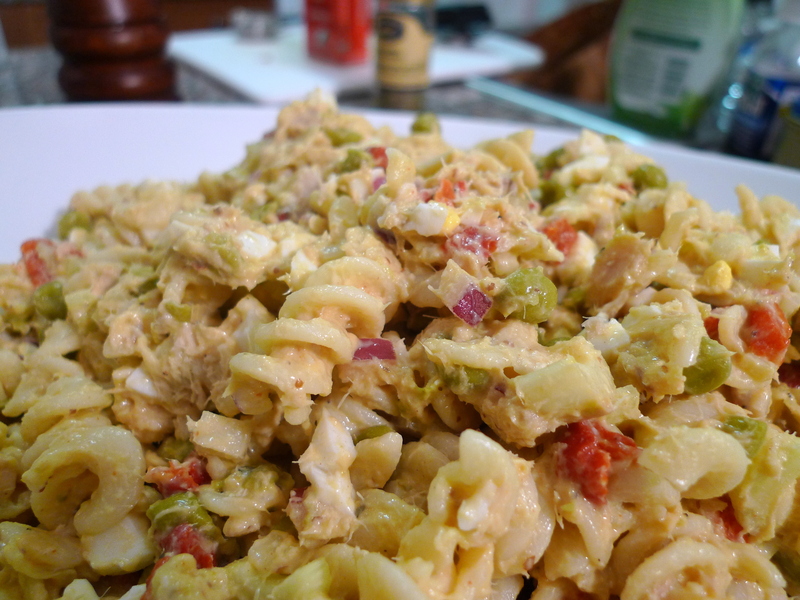 I think of pasta salad the same way I do of fried rice; a way to get rid of random leftovers in your refrigerator. After making a ginormous pot of chicken noodle soup (also a great way to make full use of a chicken carcass), I had some leftover vegetables and cooked pasta. 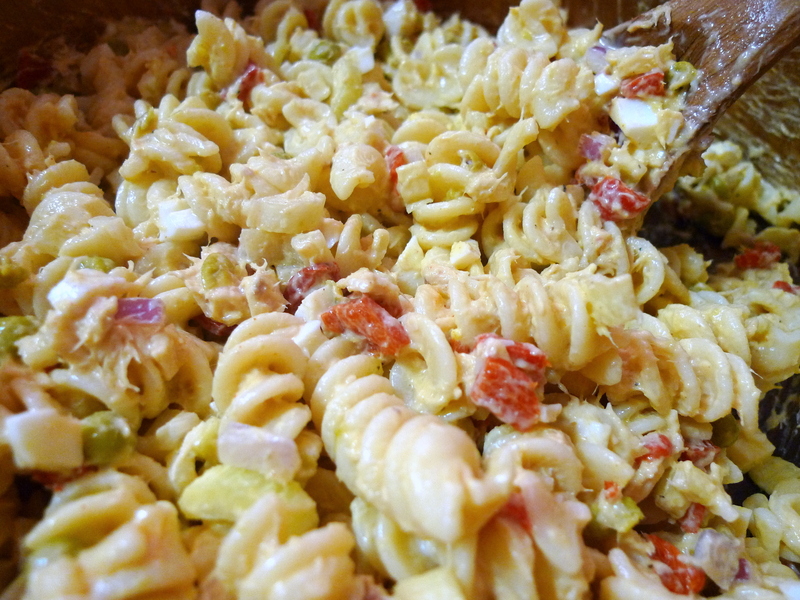 Normally, I make tuna pasta salad with Conchiglie shell pasta but since I already had cooked Fusilli spiral pasta, I went with that instead. This is a very simple recipe, and by that I mean… a bit plain. 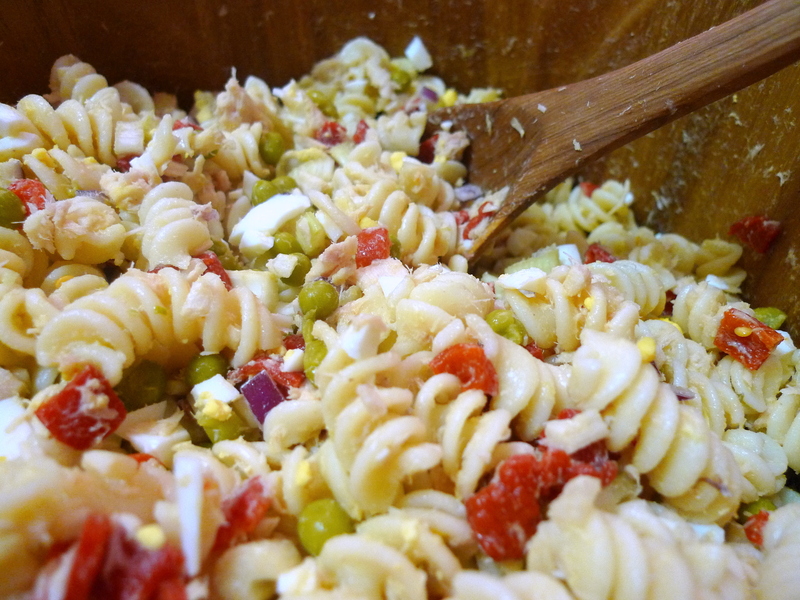 But that is how I like my pasta salad: simple and refreshing. I do not like to smother it with globs of mayonnaise and bottled dressing; I like to keep it as healthy and natural as possible. Additionally, my roommate is not a huge pasta fan in general, so I try to keep the pasta to “other stuff” ratio low. 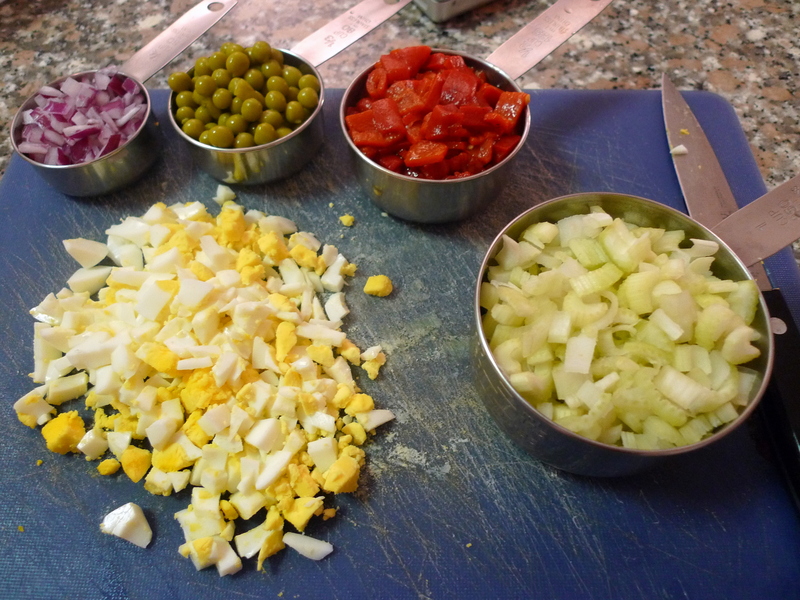 In a small pot, place eggs in a single layer and cover with cold water until covered by an inch. Bring to a boil and then turn off the heat. Cover and let sit on the burner for 10-15 minutes. Remove the eggs, and place in cold water until cool. To check if an egg is fully hard-boiled without cracking it open, try spinning it on the counter top. If it flops over right away, the egg is not fully cooked. If the egg continues spinning, that means the egg is fully cooked and thus the weight is distributed evenly throughout the egg. Bring a large pot of water to a boil. Add a dash of salt and your pasta. Cook 8-10 minutes until tender and drain. TIP: Drizzle some EVOO over the drained pasta and toss to prevent the pasta from drying out and clumping together. Set aside. 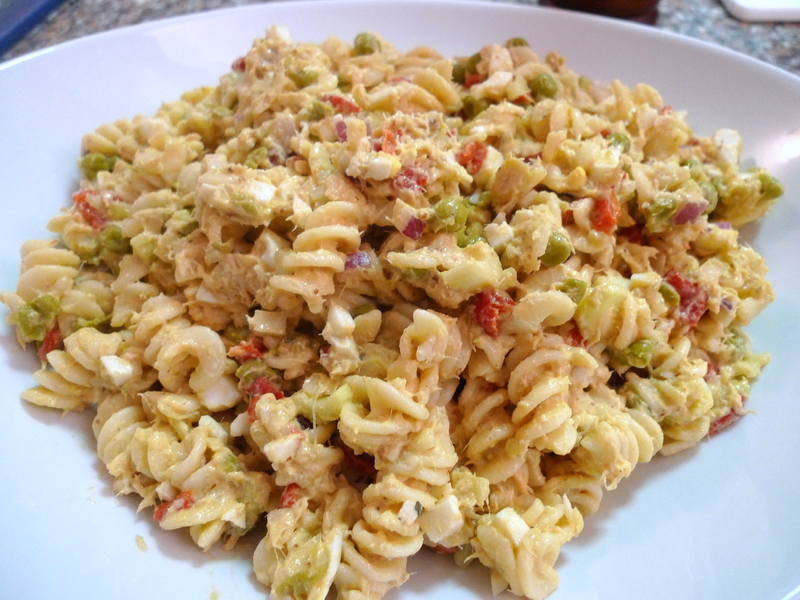 In a large bowl, combine pasta, eggs, tuna, celery, roasted red peppers, peas, and red onions. In a small bowl, whisk together mayonnaise, Dijon mustard, lemon juice, and paprika. Pour dressing over pasta mixture, and mix together. Season with salt and pepper. Chill in the refrigerator before serving. Enjoy! I have used the same tuna pasta recipe for over 10 years and I decided to try something new. I found this recipe and I was skeptical but, holy moly, this is delicious. The egg and Dijon mustard are, in my opinion, the key ingredients to this wonderful dish. I am so happy I tried it. I will never go back to my old tuna pasta recipe. Thank You!